Supporting the communities in which we work has always been important to us. 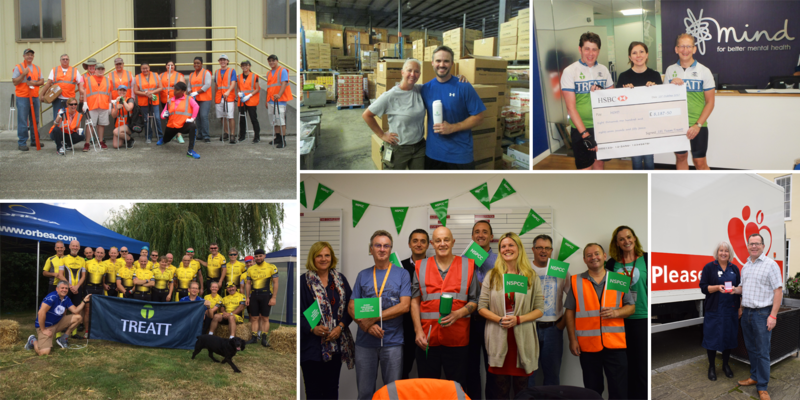 Over the last six months we’ve been following some of the projects and challenges taken on by our staff and look at how they have helped the communities we live in and charities across the globe. At our base in the UK, two of our enthusiastic cyclists embarked on one of the most epic cycling challenges in the world, travelling from London to Edinburgh and back again, all in under five days. That’s an amazing 1441km (895 miles). Ken Ferguson and Barry Kirby were supported by staff across all our global offices as well as a supportive tweet from the one and only Stephen Fry. After months of planning and training with the help of team manager Bruce Sinclair, they successfully completed the challenge raising over £8,100 for Mind, a charity supporting mental health. Other cycling enthusiasts also took on their own challenges. Andrew Campbell completed a 100 mile ride in aid of Alzheimer’s Society raising £700, and Nicola Powell lead a ride and lunch with her local cycling club, helping raise funds for Ken and Barry’s challenge. Across the pond in Lakeland, Florida the Treatt team donned their hi-vis vests and cleaned up a two mile stretch of their local highway collecting over 19 bags of rubbish to help their local community keep clean. The team also provided huge support for the second year running to KidsPack, a charity that supports disadvantaged children with food packages and clothing. Over 54 staff members volunteered with groups helping consistently every week. Back in the UK, one of our long-standing members of staff, Tony Allen, who has been with us for nearly 30 years was awarded a special commendation for donating his 100th pint of blood to Give Blood. Tony discovered he has a rare blood type that can be given to anyone regardless of blood type making it especially important to Antenatal units. And finally, we welcomed the NSPCC to our UK offices to talk about keeping children safe online. Members of staff were given advice on how to manage what their children see when using the internet, apps, social networks and more. We are supporting the NSPCC’s ChildLine with a ‘walk a mile at lunchtime’ challenge during October, donating £1 per mile walked by every member of staff. Keep an eye out for further stories on our charity and community support work over the coming months, there’s a lot more to come.